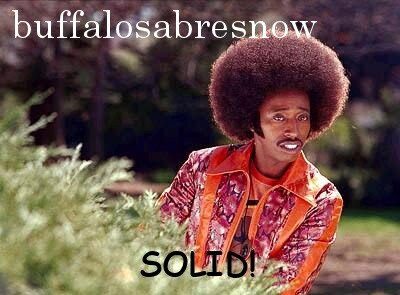 buffalosabresnow: Zero is no hero. Plus, Botterill's trade deadline plight. Zero is no hero. Plus, Botterill's trade deadline plight. For those of us old enough to remember Schoolhouse Rock, zero "is a wonderful thing" says the voice-over, "in fact, zero is my hero." A zero in sports is good if it represents points against, obviously not so good if it's the number of points you score. 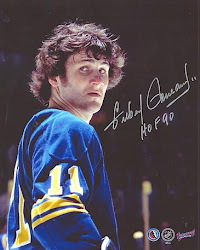 Last night the Buffalo Sabres put up the big goose egg in a 1-0 lost to the St. Louis Blues. It was they fifth time this season the Sabres have been shutout, which includes scoring zero goals for a franchise record three games in a row from November 25-December 1. Zero also represents the number of wins they've had in their last four home games, as in the Sabres are on a four-game losing streak at KeyBank Center. Goalie Robin Lehner, who had back-to-back shutouts in western Canada last month, and has three on the season, was close to sending the game to overtime but Blues defenseman Carl Gunnarsson broke a 0-0 tie with just over five minutes in the third period. The Sabres came close to tying it late, but in a game of inches, "unfortunately they get a bar and in," said Lehner to the media postgame, "and we get a bar and out." For those counting, it will be zero playoff appearnces for the club since 2011, a span of six (soon to be seven) seasons and without a playoff appearance, it will soon be zero playoff series wins since 2007, a span of 11 years. It's no wonder that attendance at KeyBank Center is dwindling dramatically reaching points not seen since the early 2000's when team ownership was in turmoil. And probably the saddest part of it for this once proud franchise is that the youth, the future fans in Sabreland, are begging to get turned off. I was talking to a coach last night of seven and eight year olds who said that many of those kids have zero interest in the Buffalo Sabres. Perhaps owners Terry and Kim Pegula, along with team president will finally get the message that their plan is in shambles right now with no near-term end in sight. It's not their fault that they had two general managers fritter away loads of cash on albatross contracts with too much term for overrated players, but they should take the blame for not having a hockey man run the hockey operations. If they want to be in complete control, fine, it's their franchise, but this is the results they've gotten to this point. The hiring of Jason Botterill to be the general manager looks to be a good hire at this juncture, which is less than a year in to his tenure. Botterill played in the league for years and spent a number of years as an assistant/associate general manager in one of the best organizations in hockey, the Pittsburgh Penguins. However, he still is a first time GM and the lifting he'll have to do to get this thing back on track may be more than anyone thought. He did some work in the off season that hasn't gone as planned, and honestly, not much has, but he did do well at the draft last year in jumping on a prime prospect that dropped to him at eighth-overall. We won't see the rest of his 2018 selections for at least a couple of years or so, but Casey Mittelstadt looks like he might make the jump after only one year at the University of Minnesota. The next big step for Botterill is the upcoming February 26 trade deadline. Word on the street is that the Sabres have had the 'For Sale' sign up for months with everyone save for Jack Eichel (and possibly Rasmus Ristolainen) available. The big thing for him will be getting a return for his pending unrestricted free agents, the most sought after being winger Evander Kane. Kane is in the final year of a six year contract with a $5.25 million cap-hit. The 26 yr. old veteran of nearly 550 NHL games has 64 goals in 187 games for the Sabres (.342 goals/game,) with only seven of those goals coming on the powerplay. However, a hot start has turned extremely cold for Kane right now as he has zero goals in his last 12 games, only two in his last 21. NHL general managers interested in Kane as a rental already know what he brings to the table and streakiness in scorers isn't all that new. But what remains problematic is his off-ice/locker room reputation. Kane's reputation precedes him. Despite being clean off the ice, the recent spat between Buffalo defenseman Justin Falk and Kane where Falk called him "selfish" may have continued to put him in a bad light in the locker room. While talking with an amateur scout from an Atlantic Division team last night, the first thing that came out of his mouth concerning Kane was off-ice/locker room concerns. Although he conceded that Kane's on-ice play is excellent, that reputation will hurt the Sabres return for him in a trade. Botterill also has UFA's with very little perceived value as role players on playoff-bound team. Forward Benoit Pouliot and defenseman Josh Gorges may or may not be of interest to other teams while two-time Cup-winner Jordan Nolan (LA Kings) may have lost some of his grinding effectiveness as the speed of the NHL increased. Oddly enough, Lehner, a restricted free agent this summer, might garner some serious interest from team in or around the playoff mix, but so far rumors have the Sabres not shopping him. Regardless of whether Botterill can move any or all of his pending free agents, the return, outside of possibly Kane, won't be much. But at least it will be something which is better than nothing.